This is one of those works of art that I definitely want to share with everyone. 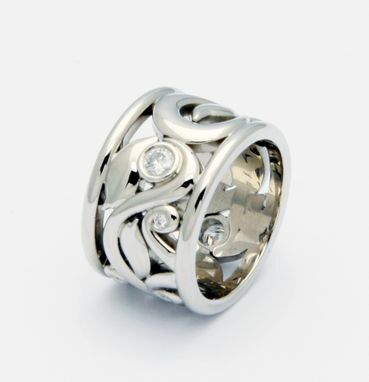 I gave this ring a vine-inspired design to complement the elegance of the diamonds. I used 19k white gold to make the metal ban and placed diamonds of various sizes around it. There are three .5 point stones and four .02 point stones on this piece. The ring has a total weight of 16 grams. I can adjust the size and modify the design for you upon request.